I’m counting down, 4 more days of work and then I have a 3 day weekend. I took Monday off for Valentine’s Day, well not really, I just took the day off. 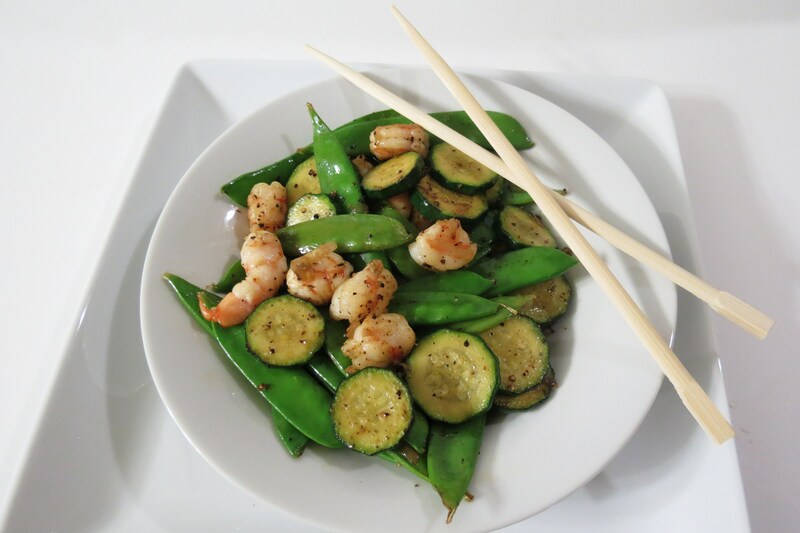 🙂 I promised you yesterday healthy, so tonight for dinner it was fend for yourself night and I made a wonderful healthy stirfry, which I am very pleased with. I threw this together in 10 minutes, start to finish. I love quick healthy meals. I don’t know what it was, but the stirfry tasted buttery, which I loved. 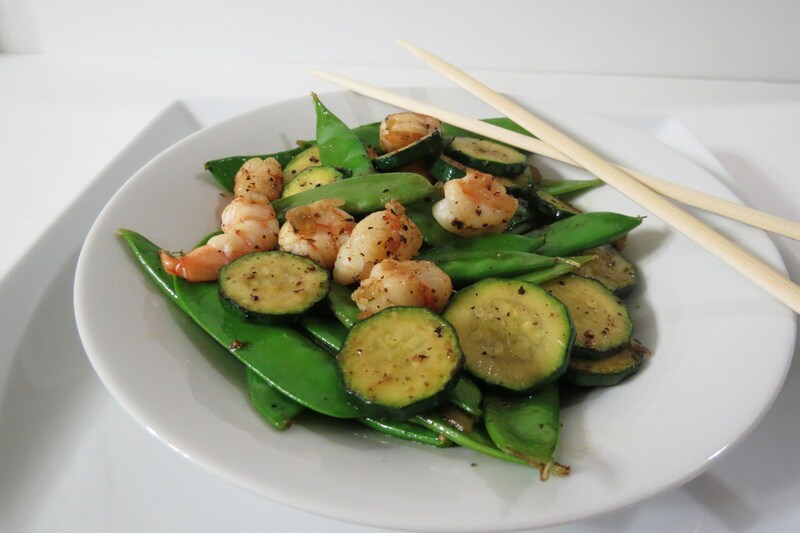 Not sure if it was the shrimp or the snow peas? I used 4 uncooked Wild Blue Shrimp that I picked up, can you guess from where? Trader Joe’s! I had it in the freezer and figured I better use them up before they get frost burned. I really like to cook with uncooked shrimp because it’s easier to tell when there done. However if you have already cooked shrimp, just toss them in and cook until warmed. You could definitely use this for two servings, but I ate the whole thing. I also used Trader Joe’s garlic infused olive oil. If you don’t have garlic infused olive oil, I recommend using 1 clove of garlic, diced up. It goes perfect in this dish without being over baring. 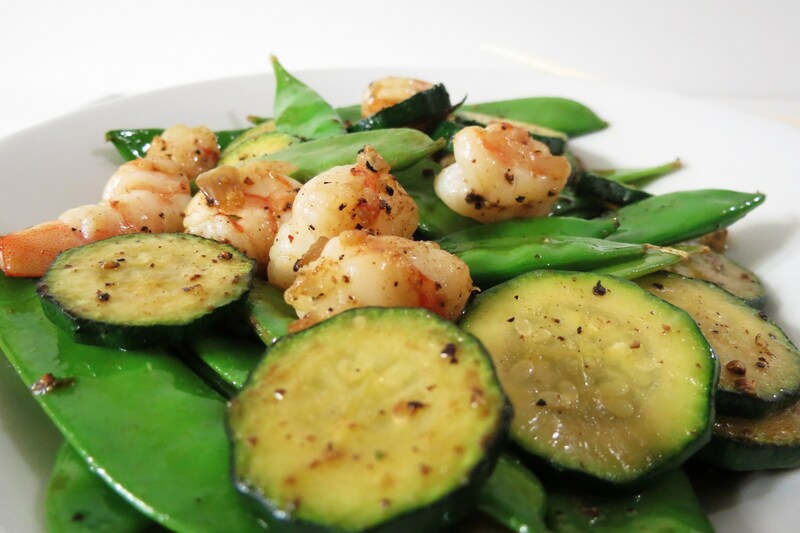 In a wok or skillet, add olive oil and shallot, cook until tender about 2 -3 minutes. 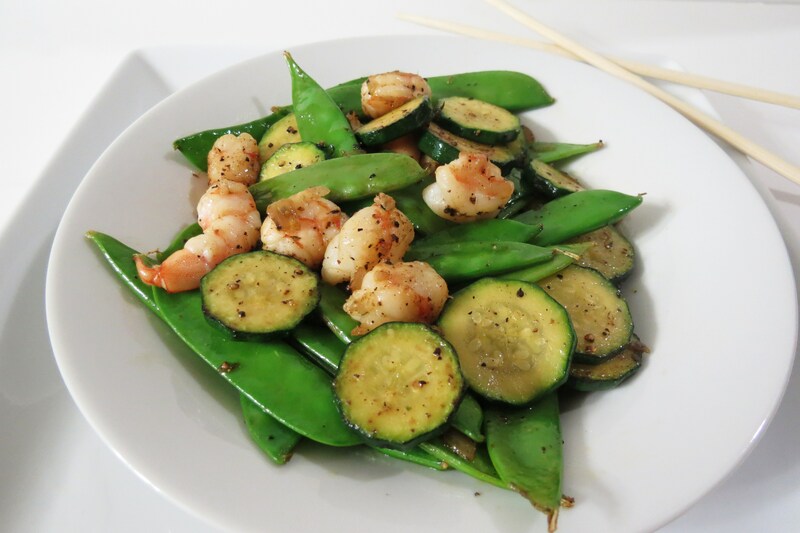 Add snow peas and zucchini, cook for about another 3 minutes and then add your shrimp. Cook until shrimp is no longer pink about 2 to 3 minutes longer. I was in an auction for charity and sold a couple batches of Funfetti Cookies, so I am off to make them tonight, so I must go. Oh and my husband asked if I could make chocolate chip cookies with bacon. I won’t post that recipe, I can only imagine how high the calories will be in them. Wish me luck on not eating the batter or trying a cookie. Oooooo Looks rather tasty! Love the idea of garlic-infused oil. I think I saw somewhere how to make your own by simply sauteing some minced garlic in olive oil for a bit…no wait, I think that was something else. I’m sure you can make your own, though. Off to research that! You have to let me know what research you came up with. I would love to make my own roasted garlic oil! Yum!! I’m thinking roasting a head of garlic in the oven and mayeb letting it sit in plain oilive oil for a couple of days? Then putting the olive oil through a strainer to get rid of the garlic? I love stirfry and this one looks amazing. yum! YUM! 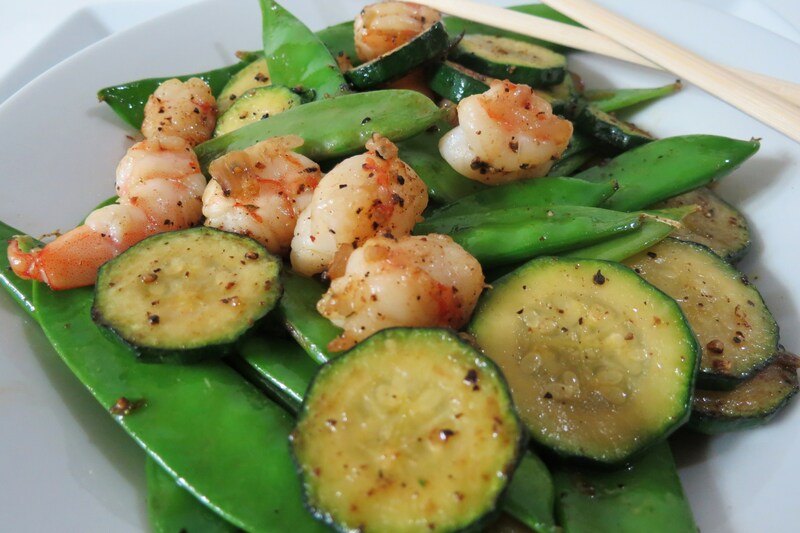 I haven’t had shrimp in a long time and I think this recipe will change that. 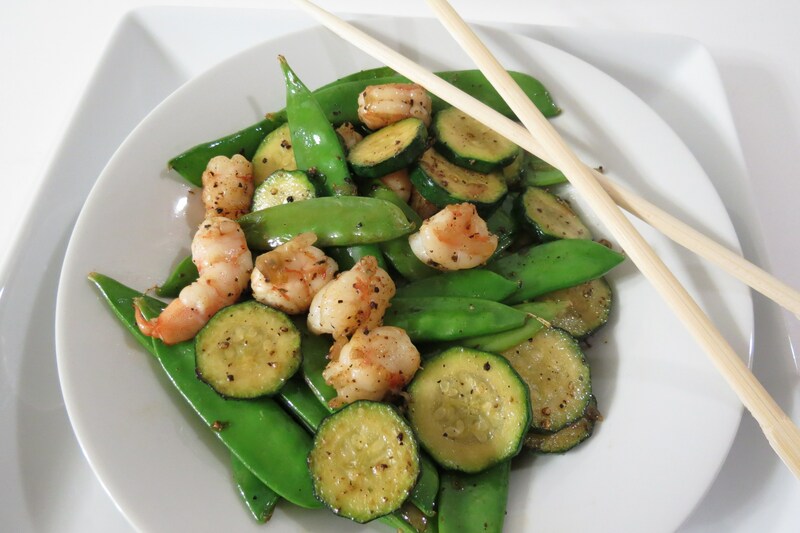 I have never thought to use zucchini and snow peas with shrimp–great idea! The olive oil infused in garlic sound amazing too. It’s a wonderful combination, you should try it! Mmmm…your pictures just jump out and say “eat me.” This look so delicious, light, and refreshing. Thank you for sharing it at Allergy-Free Wednesdays! Be sure to check back next week for the features and to link up again.